Review: "Infront: Wordless" - Sea of Tranquility - The Web Destination for Progressive Music! 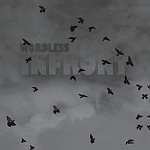 "Wordless" is the debut, full length album for the Russian band formerly known as Invisible Front. This aptly titled disc contains 8 instrumental tracks. Each song is different from it's predecessor, and each number is fairly solid. If we must pigeonhole the band's sound , I guess we'd have to label them as a modern fusion outfit. However, they're not just about chops. These guys can craft some sublime numbers. The foursome, consisting of a twin-axe attack and a drums/bass rhythm section don't come at you with both barrels blazing like many chop-heavy young musicians like to do these days. Numbers like "From Where The Wind Blows" certainly soar at times, but one gets a sense that it's much more important for the band to show a good musical balance instead of having one lead instrument tear it up. Each number seems to want to explore a slightly different tone pallet. "888" starts playfully before launching into a superb guitar-heavy foray, while the following track "Autumn Velvet" takes the band closer to their Bohemian roots and features some horns to round out the sound beautifully.The opening moment of "RUNNN" has the band flirting with a Porcupine Tree-like mixture of heaviness and melancholia, before morphing into a Djam Karet style heavy jam. The one track that really stands apart from the others, style-wise, is the closing epic "Chinese Butterfly". One always expects to song to burst at the seams and come alive at some point, but it just creeps along very slowly and deliberately. It becomes a vehicle for the musicians to play with subtle musical tapestries.The song title is very appropriate as the track leads into a very � propos segment which instantly evokes images of the Middle Kingdom. Upon first listen, one may feel the track does not fit into the style of the preceding 7, but after repeated spins one starts to get a better understanding of all the subtle sounds the band seeks to create on this record, and the number is merely another feather in the group's impressive cap. This one has been growing on me in leaps and bounds.I haven't been this jazzed about a record in this genre since 2003's superb offering by Hungary's Inkabb Holnapp. "Infront" offers their own unique style of music and shouldn't be immediately compared the latter, but I think fans of that disc would find plenty to enjoy on this one. This may be a late addition to my top 10 of 2005. Worth a listen!